Accurate weather prediction depends on a fundamental understanding of storm dynamics and cloud microphysics and their representation in numerical weather prediction (NWP) models, as well the optimal use of high-resolution multi-parameter measurements, according to Professor Guifu Zhang at the School of Meteorology, University of Oklahoma, and one of the authors of a recently published review paper in Advances in Atmospheric Sciences. After decades of research and development, weather radar polarimetry has matured and high-resolution polarimetric radar data (PRD) are now available nationally and globally. There is high expectation that the rich information provided by PRD has great potential to improve the observation, quantification and forecasting of weather. Although successfully employed in severe weather detection, hydrometeor classification and quantitative precipitation estimation (QPE), Professor Zhang and his colleagues note that the potential impact of PRD in weather prediction has been limited by their often subjective and empirical use. "And the gap between the radar meteorology/hydrology/engineering and NWP communities," says Professor Zhang, "prevents the realization of the full potential of radar polarimetry in QPF [quantitative precipitation forecasting]." 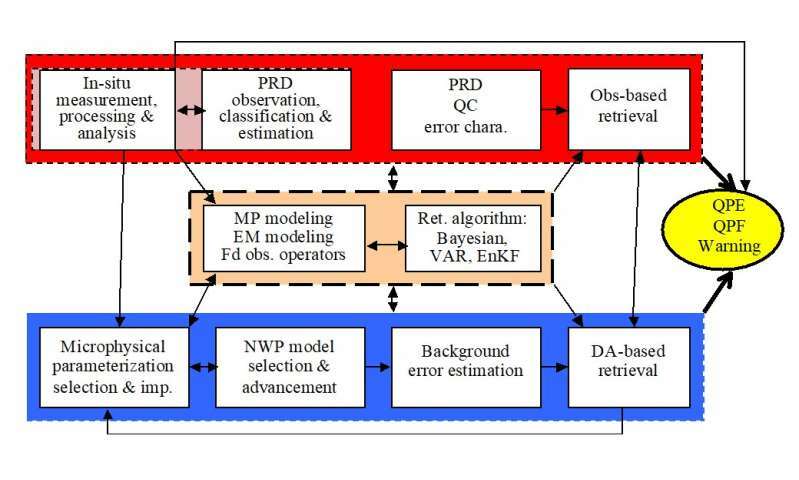 Considering the difficulties involved in the optimal use of these newly available PRD and in further advancing weather radar technology, as well as bridging the gap between radar meteorology and NWP, Professor Zhang and his colleagues propose a systematic and unified approach to the optimal use of PRD for accurate QPE, QPF, and warnings based on statistical retrieval with model physical constraints where prior information is used. This would link the observation-based retrievals (top row in the figure) used by the radar meteorology community with model-based analysis, also referred to as data assimilation (DA) (bottom row), used in the NWP community. As illustrated in the middle row of the figure (brown), the forward operators, which result from microphysics modeling and electromagnetic modeling, and statistical retrieval algorithms, are required for both observation-based and DA-based retrievals. Each of the retrievals needs to have compatible microphysics models, such as DSD/PSD models, and shape/density relations, electromagnetic modeling and calculations that yield accurate and efficient forward observation operators, as well as statistical retrieval algorithms that can handle measurement error and background information and covariance. "To achieve the best possible results, all components need to be accurately determined and selected, and used in conjunction and cross-verified with each other in the statistical retrieval algorithms," concludes Professor Zhang.